179kw 380nm from a k03s 1.8T, damn that is impressive! Who's car is this and what mods? I see the sheet states RK Intake only. 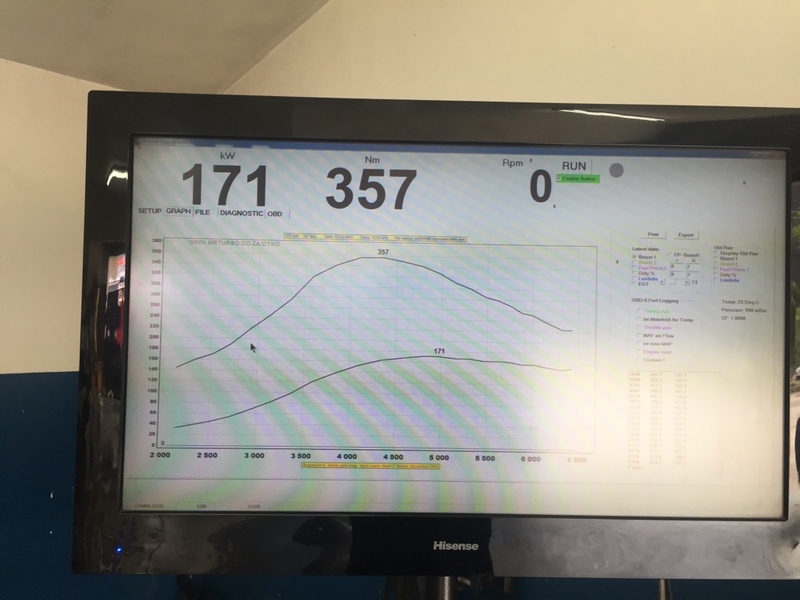 Is that dyno reading at flywheel or at the wheels? come Georgie ... have some popcorn bro. pyro-zn wrote: come Georgie ... have some popcorn bro. Why does the Torque peak so late? SemiColon wrote: Why does the Torque peak so late? Big boost spike if they making peak power at 4500 rpm. Car is Wesleys from Eightysix automotive, car has DP as well as an intake made by himself. Hi guys. It's my Cupra. That graph is giving me nightmares Why does the torque peak so late? Pynoxim wrote: That graph is giving me nightmares Why does the torque peak so late? We all know the limits of the 1.8T on stock rods and small framed turbos. Torque and power curves are moved higher up in the rev range, also notice how power is held almost until redline. 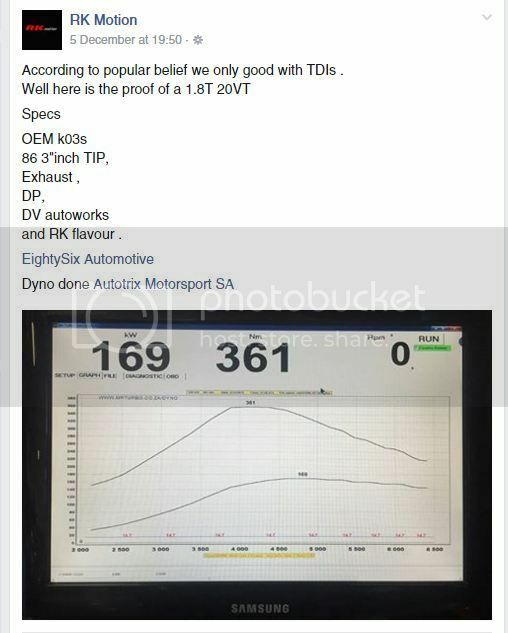 Good work Wez, most guys have long forgotten the 1.8t maps, so its epic seeing you and RK are still developing them, personally I think you guys have been thinking out the box by moving torque higher up the rpm, and the results speak for them self. True (maximum) torque peak would be determined by the turbo geometry and engine characteristics. To move the peak later would be to lop the true peak and accept a lower torque peak. So 380-400 Nm true peak at 3000-3800 rpm, and 350-360 lopped peak at 4000 - 4500 rpm. You can't move the actual torque curve without changing mechanical components (turbo/cam/headwork etc). Great figures though, nice and smooth! THANAS wrote: True (maximum) torque peak would be determined by the turbo geometry and engine characteristics. To move the peak later would be to lop the true peak and accept a lower torque peak. So 380-400 Nm true peak at 3000-3800 rpm, and 350-360 lopped peak at 4000 - 4500 rpm. You can't move the actual torque curve without changing mechanical components (turbo/cam/headwork etc). All good and works in theory. Anyone is more than welcome to come and see the car and inspect the 100% stock factory components mentioned above. I think you misinterpreted my post, I'm not contesting whether the car is stock, just saying that the torque curve has been manipulated by reducing the peak to below the true peak attainable by the turbo. 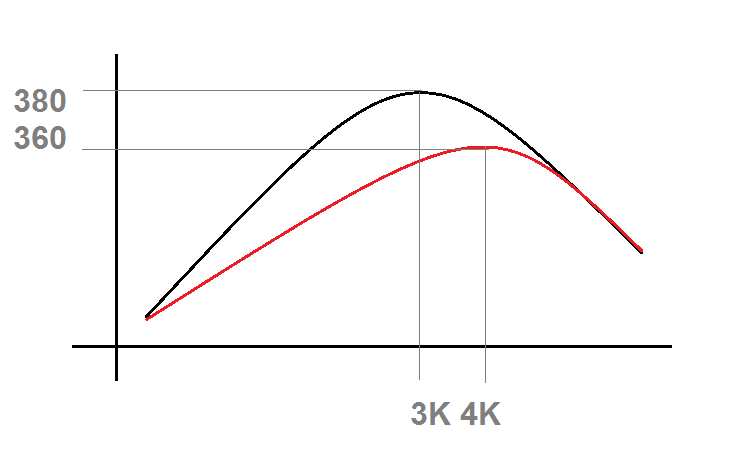 The setup is exactly the same, but in the red graph, the boost has been reduced, showing a lower peak and a later peak, although the peak attainable torque curve itself is the same. I understand where you are coming from. Let's say the 380 is being made on 1.3 bar spike settling to 1 bar then dying to 0.9 bar and timing advance is quiet generous in the lower RPM. Then let's say a 1.6 bar spike is then added into the mix with a little less timing advance, the turbo works beyond its optimal range for those slight few 100 rpm then settles back down to 1.2/3 bar and runs all the way through to red line. This will definitely have an effect on the torque curve and the way the power is applied. boost'd wrote: I understand where you are coming from. Let's say the 380 is being made on 1.3 bar spike settling to 1 bar then dying to 0.9 bar and timing advance is quiet generous in the lower RPM. Then let's say a 1.6 bar spike is then added into the mix with a little less timing advance, the turbo works beyond its optimal range for those slight few 100 rpm then settles back down to 1.2/3 bar and runs all the way through to red line. This will definitely have an effect on the torque curve and the way the power is applied. Fully agree, in the above illustration the black line can be considered to be the ultimate torque curve, the curve where boost and timing are perfectly balanced to provide an optimal torque situation at each point in the rev range. The spike you mentioned would then push the red line up to the black line at the highest point giving the spike that small turbos are known for. But a good tuner would know not to push torque at the true peak and rather allow the WG to bleed off exhaust gas and boost to save rods. So changing boost/timing would definitely change the effective torque curve, but the ultimate torque curve attainable would be a function of the turbo geometry and mechanical setup/fuelling. Last edited by THANAS on Tue Dec 15, 2015 8:35 am, edited 1 time in total. boost'd wrote: Hi guys. 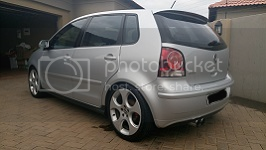 It's my Cupra. Good figures, and awesome curve! There is an RK motion tuner in Cape Town right? JasonCPT wrote: Good figures, and awesome curve! 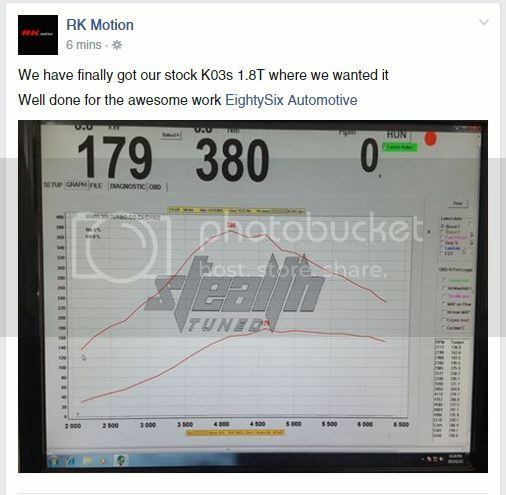 There is an RK motion tuner in Cape Town right?